We are really excited to be joining Aotea College and providing food for you this year. 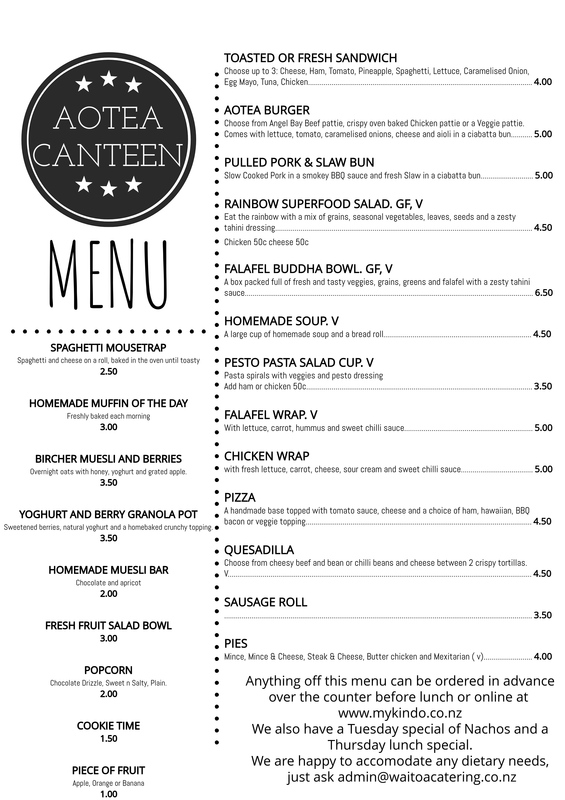 The Canteen is under new management with a fresh new menu. Our goal this year is to provide tasty, healthy lunch options and we will be working closely with the Heart foundation NZ to achieve this. There is now the option of pre-ordering lunch online through www.mykindo.co.nz .This is available to all Students and Staff, just register your details and select Aotea College. In addition to the pre-order menu we will be open for breakfast, morning tea and lunch with a selection of freshly made counter food.